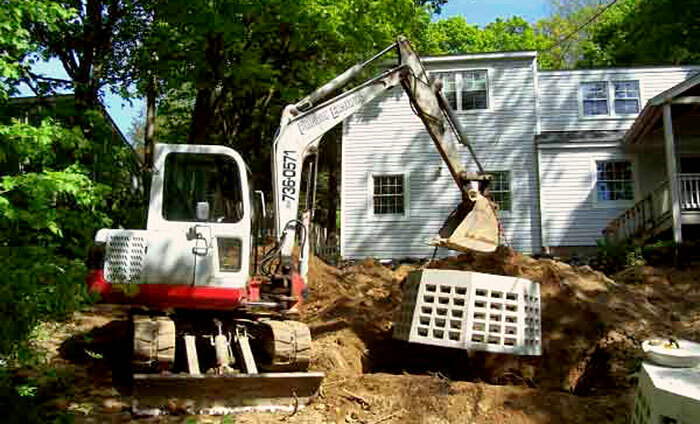 As experienced designers of drainage systems, Precision Excavating knows that the installation of dry wells can be effective for washing machines, gutters and roof drains. Dry wells are commonly used to distribute and filter the laundry grey water coming from the washing machine. Dry wells for gutters and roof drains are used to handle the water flowing from the roof during a precipitation event. Using a dry well can assist to redirect the water away from the house’s foundation thus keeping the basement from flooding and preventing mold build-up. If you have an existing dry well it can be replaced using plastic chambers or concrete seepage pits. If you do not have an existing dry well, we can design a plan to be approved by the Board of Health.